The George Washington House is the only house outside the USA where George Washington ever resided. The young George Washington and his ailing brother, Lawrence, resideded in this historic plantation house, also known as Bush Hill House, for two months in 1751. The handsome Georgian-style house has been restored and furnished as a typical, but not luxurious plantation residence of the mid-18th Century. A museum has been installed on the upper floor of the house. It focuses on the story of the rich, cultural heritage of the island in the 17th and 18th Centuries. This was a time when Barbados was one of the wealthiest countries in the hemisphere, Bridgetown one of the three biggest cities with Boston and London when the Barbados Adventurers set off and colonised North and South Carolina, and when the British established the largest Garrison in the colonies. It also features an examination of the shameful practice of slavery that dominated plantation life in the Caribbean and the southern USA. 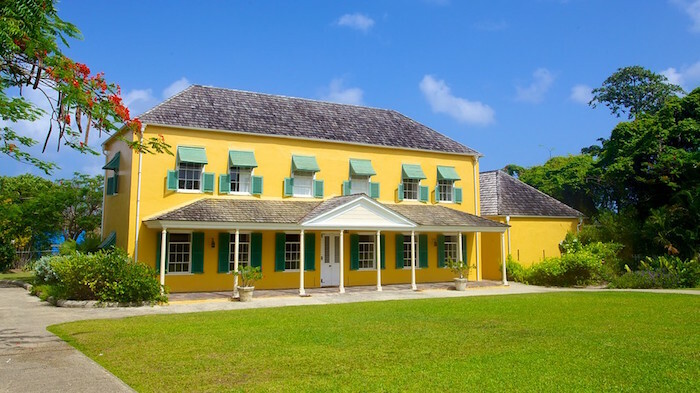 Start by viewing a film featuring George Washington in Barbados in the small theatre, and then join a guided tour of the main floor of the house and upstairs to tour the museum. Visitors can also explore the grounds, enjoy the gardens, shop in the Gift Shop and enjoy cool refreshments in the cafe.